Flash Monster II has met its end. Results and Flash Monster mega-issue on Halloween. Flash Fury blew the roof off this motha. We’ve never had such a strong turnout in submissions or such a difficult decision-making process with our final cuts. The good news is that we’ve now made it through a full year’s cycle of our quarterly contests! All prize winners and runners-up will be featured in our upcoming Prize Winners print anthology. So keep on eye on social media for further details. 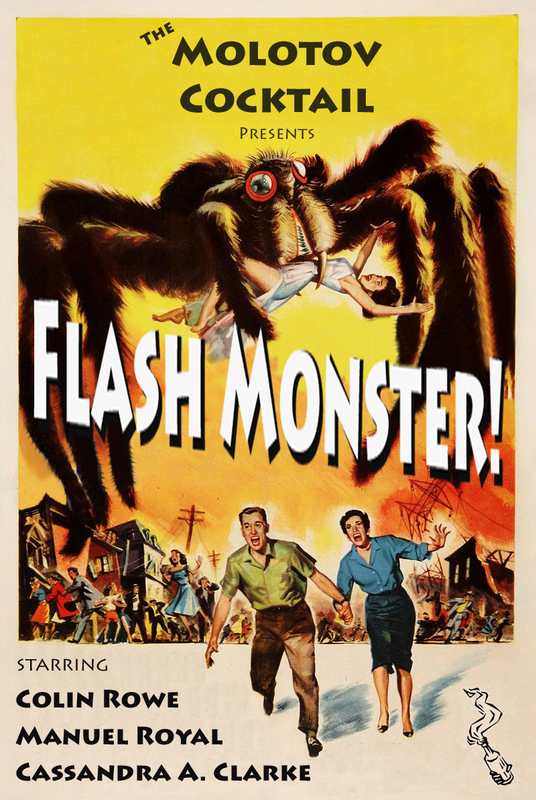 We’re also excited to once again revisit our #FlashMonster theme for our next contest. The prize winners and runners-up will be featured in our Halloween issue dedicated to all things Flash Monster. The Top 10 finishers will also be included in a future print anthology for our second year of quarterly contests. The theme of Flash Monster 2 is pretty self-explanatory. We want you to retreat to the lab and not come back out until you can unleash some of the most intriguing or vile abominations ever to hit the page. Gore is cool, but so is dramatic irony and unnerving ambiguity. Basically, though, the types of monsters you can explore are limited only by your sick, sick imagination. Therefore, monsters can include halitosis-afflicted werewolves, salad shooter-fingered bridge trolls, radioactive orangutans, resurrected pharaohs with bad perms, acid-spitting hummingbirds, zombies that only crave vampire brains, Donald Trump, a pink mist that makes people eat their own lips, ghosts of winter solstices past, a pandemic proliferated by e-cigarette huffing hipsters, sinister bubbles, leeches that can read minds, hiccups that turns people inside-out, spatula-wielding aliens, or trees that hug back. The top three entries will win cold, hard cash—and we’re even pumping up the 2nd place prize by $25 to make the payouts all symmetrical-like. Follow these guidelines, and you could have some extra coin in your pocket, and some bragging rights as this year’s Flash Monster winner. – We reserve the right to extend deadlines if necessary (and you can probably expect our several-day Procrastinator’s Special–with corresponding increase in submission fee so it’s still fair and all). – Contest submissions accepted until roughly 11:59 PST on 10/15/15 10/19/15 for Procrastinators’ Special. Winners announced by October 30th and we’ll unleash the Flash Monster prize-winners mega-issue on Halloween. – And, most importantly, this is a FLASH MONSTER contest, therefore you must include some sort of monster or monstrous element. However, that monster can be in any form imaginable. After reading your story, we don’t want to be able to sleep a wink.